The Australian Women’s Weekly middle eastern (not sure why they went with lower case for a place name, but who am I to ask such questions) was the book I cooked for when I had a friend visiting and the vegetarian who lives with us was away for the weekend. I was going to cook a dessert, but we filled up on the two dishes I made, and dessert was not something we could manage, so we skipped it. This book doesn’t have a lot in the range of vegetarian dishes that aren’t salads, and as I was cooking dishes in winter, salad was not very appealing. Being a relatively recent AWW book, it’s triple tested, with clear instructions, and the dishes I made were tasty. Overall I give this 3 out of 5 stars (I wanted to be more inspired). Heat the oil in a pan, add onion and garlic, cook, stirring, until the onion is soft. Add cumin, cook, stirring,until fragrant; cool for 5 minutes. Blend or process onion mixture, chickpeas, tahini, juice, coriander, paprika and buttermilk until smooth. Spoon into serving bowl, drizzle with a little extra olive oil, if desired. Serve with bread. It was good, though it was way too much. Next time I’ll halve the recipe. 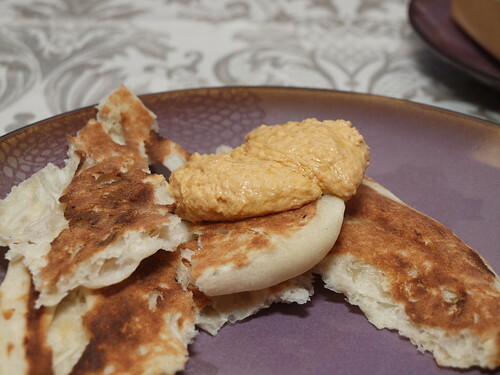 I served this with toasted naan that I had left over from earlier in the week because I forgot to buy flatbread. It still worked. Meanwhile, dry-fry spices in a small heated frying pan, stirring, until fragrant. Heat remaining oil in same saucepan; cook the onion and garlic, stirring, until onion softens. Return chicken to pan with spices and stock; bring to the boil. SImmer, covered, for 40 minutes. 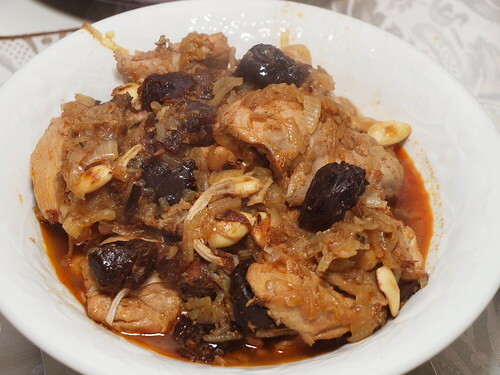 Stir in prunes; simmer, uncovered, for about 20 minutes, or until chicken is tender. Stir in nuts and parsley. It was very delicious. I served it with pearl couscous which didn’t do a good enough job of soaking up all the liquid. I kept the left overs and froze them, for a meal sometime in the future when I am too busy to cook. You could make it less liquidy by reducing the amount of chicken stock you add, however, the liquid in this recipe is what makes the chicken very very tender.